Yesterday Bryce Harper was traded for Max Scherzer. Andrew and I both gave our two cents about the trade. While neither of us particularly loved the trade for various reasons. I believe we both came to the conclusion that they both felt the need to make the trade to move their post-draft depth and switch it into post-draft weaknesses. For this post I want to ignore that context. Let’s look at Bryce Harper versus Max Scherzer. Last year in 2015, Bryce scored 1,407.4 fantasy points and Max scored 1,372.5 fantasy points. Just a bit over a point a week difference. You know as well as I know, that not all weeks are treated equal. So I built these two graphs comparing the 22-fantasy week season, comparing how each player did in those seven days stretches. Sometimes Max gets two starts in a week, sometimes he does not. Clearly sometimes Bryce plays 7 days in a week, or less. It happens. But, from your top players on your team its safe to assume, when they are available you are going to go with them, so we can compare these two players who play different positions with some reasonable expectations. 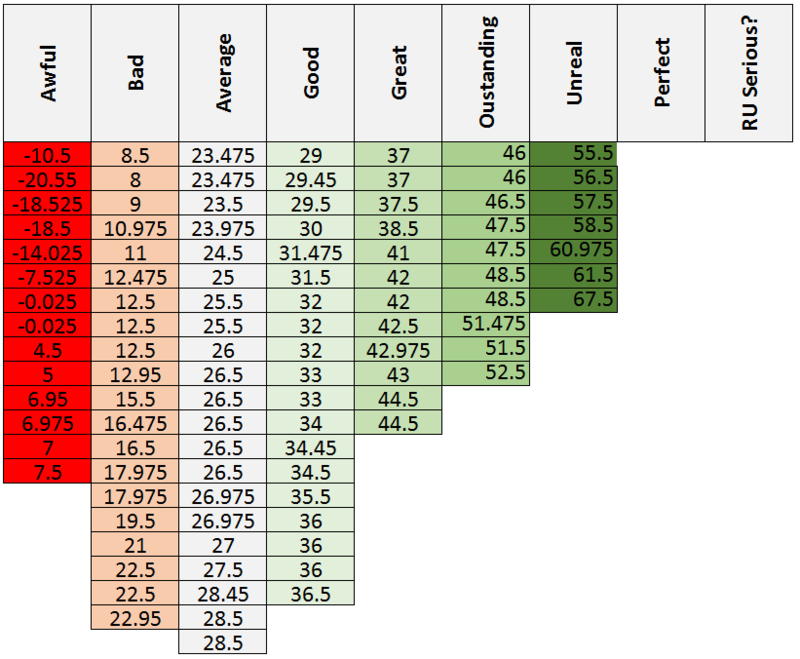 This is similar to the charts I had a few weeks back, where I looked at Clayton Kershaw’s value because of his starts. These are a bit different as I stated. 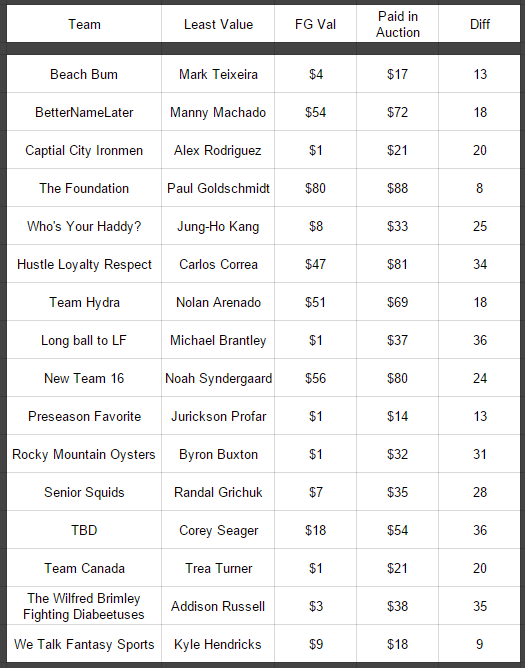 In 2015 each player recorded values in all 22 fantasy weeks. As you can see they’re quite similar. Bryce was never awful, but they both had three weeks below average. Bryce was beyond outstanding five times to Max’s six. Really amazing. They key to take from these two pictures. Is that basically two players were basically dead even. When you remove the context of the draft, of how the teams will have to proceed with back-fill going forward, among other tiny details. Things look pretty good. Both parties seem quite content that both won the deal, and perhaps… maybe they’re both ahead. 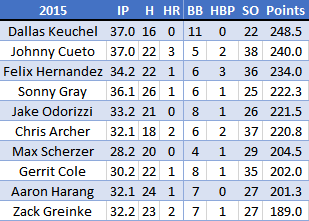 Starting pitchers what say you? Those who are new to an OttoNeu scoring league such as this are in for a real treat. Especially with our head to head rules that limit teams to seven (7) games started (GS) by a SP each week. This creates a huge opportunity cost when selecting the starts you will be using each week. So on this leap day, let’s leap into it! Would you rather have one Clayton Kershaw or three versions of James Shields? The answer isn’t so clear. James Shields is pretty good. He’s slightly above average. He’s one of my “comfortable” starters. Meaning any given week, I’ll use his start that week without much hesitation. He’s not awesome anymore, but he’s not awful either. Kershaw is projected to go for over $100 in the auction and no matter what, based on past production he’s certainly going to go for a value. What you’re buying with Kershaw is an ability to get deep into games. The last three years of Kershaw saw him pitch into the 7th inning 73 of his 93 starts (that’s more than 78% of the time). You’re also buying that he’s the team ace so he’s going to rarely get pulled before the 5th. Part of his job is to give his team’s bullpen a breather. In fact, Kershaw failed to get through five innings just twice in the last three seasons, and one of those games was the last game of the year in 2015 where he was pitching for records. What do those two things mean? Deep into games often leads towards higher points ceilings. Low chance of an early hook means higher points floors. Now there’s more than a few aces out there who accomplish both of those things every five days. 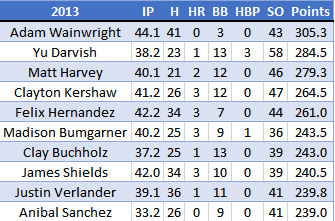 But Kershaw, as you know, is ridiculously good on top of just chewing up innings. He strikes guys out (points! ), he doesn’t allow many walks, homers or hits (avoid negative points! ), and he’s reliable. Keep in mind that before you look at the following graph, that James Shields makes 101 starts, with an average 32.5 points per start (getting 32.5 points from a start is very good!). Wow. Those are two different distributions. 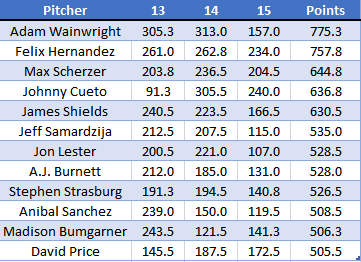 Keep in mind, Shields according to Steamer projections is set to be about the 30th best SP for 2016. 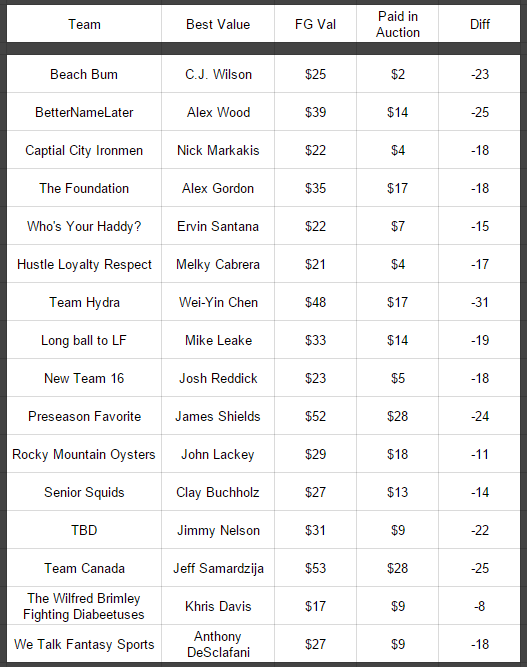 In a 16-team league, Shields is a SP2. There’s two things to really take from this. Kershaw, about once a season, in one single start, is worth the equivalent of almost three GOOD starts. THREE! Then on the flip side the awful starts. Kershaw has one a season. Shields has just enough that you’re probably not predicting when they happen to avoid. Those negative starts hurt your week. A lot. Bad starts don’t hurt your week so much, but they don’t make you feel good. Average starts you take and put in your hat and move on. Any good start gets your juices flowing. It’s amazing what Kershaw could do for any team. He’s so far above the rest of the world that his value is basically “name a price and just pay it.” When Kershaw has a two start week, odds are great that you’re basically playing with a 30+ point jump at a minimum over any other two start combo that your weekly match-ups throw at you. Consider that like an extra start, or like adding Ryan Braun‘s average for a week to your line up as a bonus. Unreal. As you go down further in the pitcher pool, you’ll see what you’d expect: the distribution leans even more left (that’s the bad side). 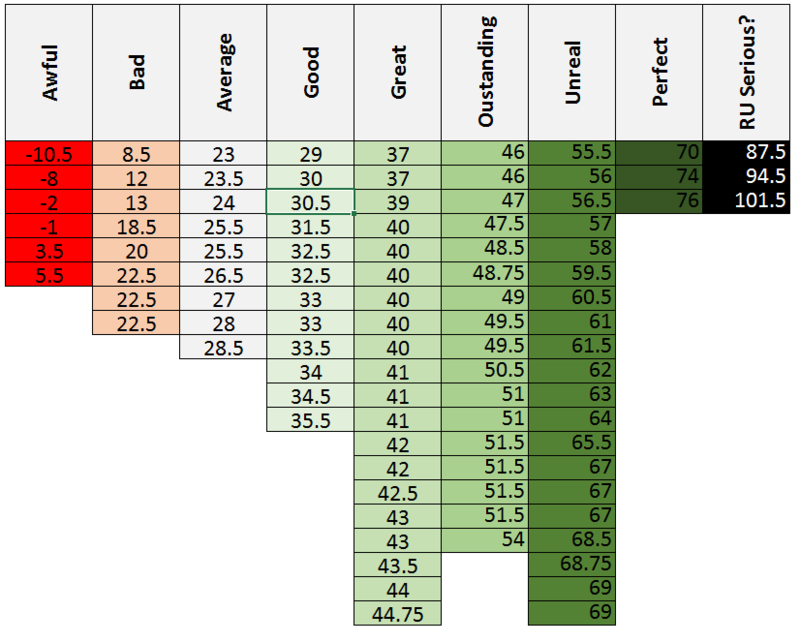 There’s some guys who will have a distribution that is much flatter, they’re inconsistently good, awful, average. A lot of times you can guess when these guys will be good based on match-ups and you can combine a few different guys to look like a good starter, but its a risky game. For those who may be consider punting pitchers, be careful, you don’t want to be in a position where you’re praying for at least a bad start from a guy who’s a spot starter that you found in the free agent pool because he’s hot garbage. It’s very difficult to cobble together your starting pitching. 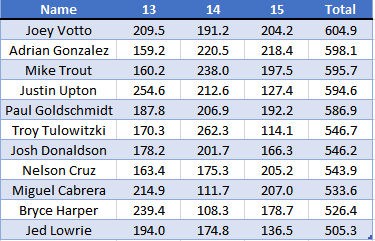 The opportunity cost that the 7-start per week limit adds to these aces is significant. Leans to the right. Yes. Max was quite good. Those perfect games, no-no are seriously awesome. But, to compare to Kershaw. Kershaw had 9 starts, average or worse. Max has SIX awful starts. Eight bad starts and nine average starts. Don’t get me wrong. Max is amazing! But he occasionally has an off day. Kerhsaw is just absurdly good. 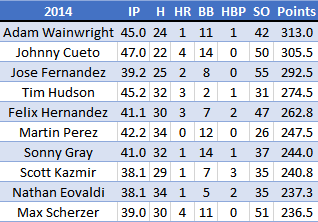 For fun, let us take a look at what an average pitcher looks like over 3 years. 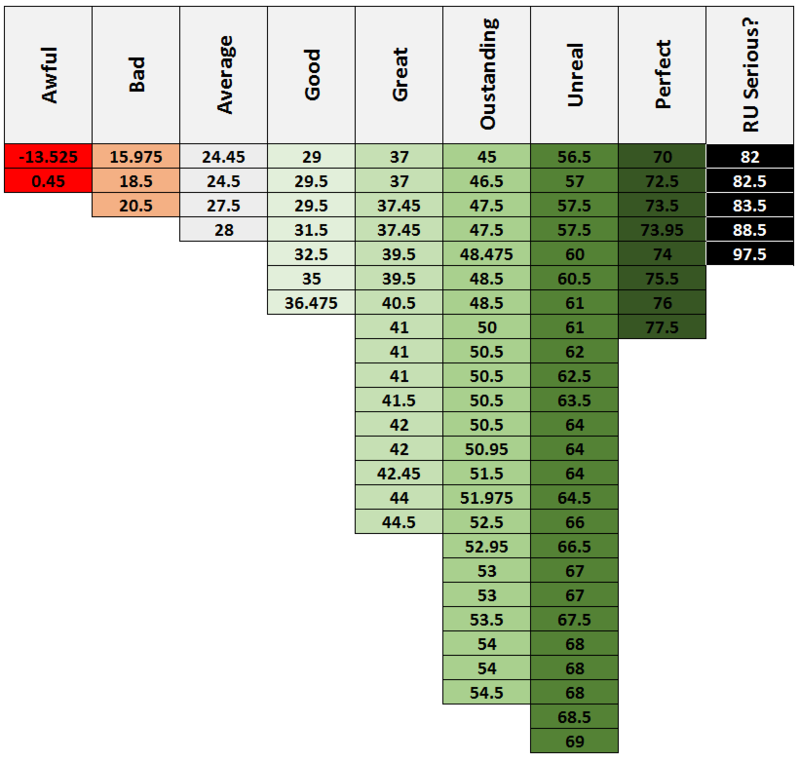 This becomes a hard exercise, nobody is exactly average for three straight years, so what I did was combined Jarrod Parkers 2013 with Jorge de la Rosa‘s 2014 and Mark Buerhle‘s 2015 and smashed them together to make the 27 point per start SP. Here’s the graph. It’s a mixed bag. 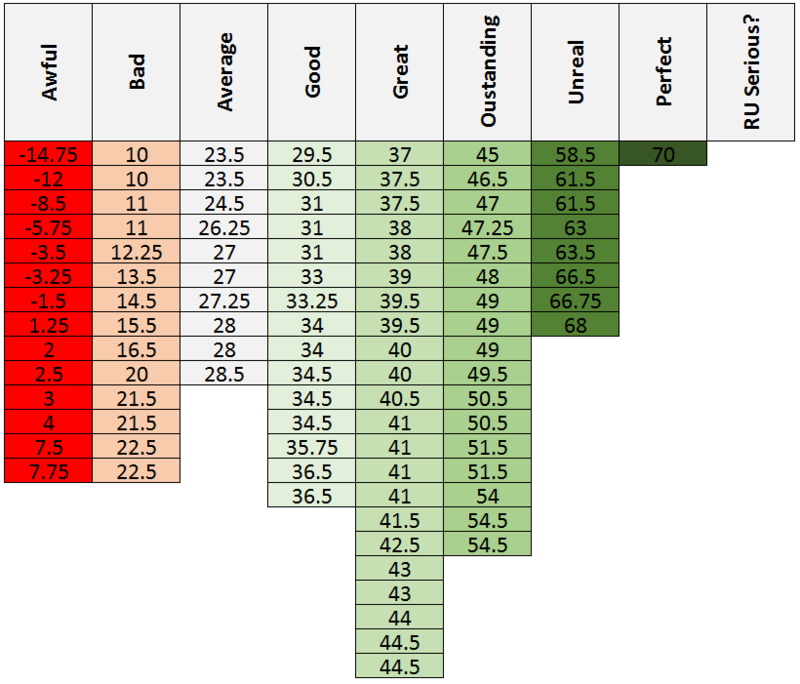 Plenty of great useful starts in there, but the red and peach columns start to add up really quick. You’re looking at a $10-$20 pitcher. Good luck!